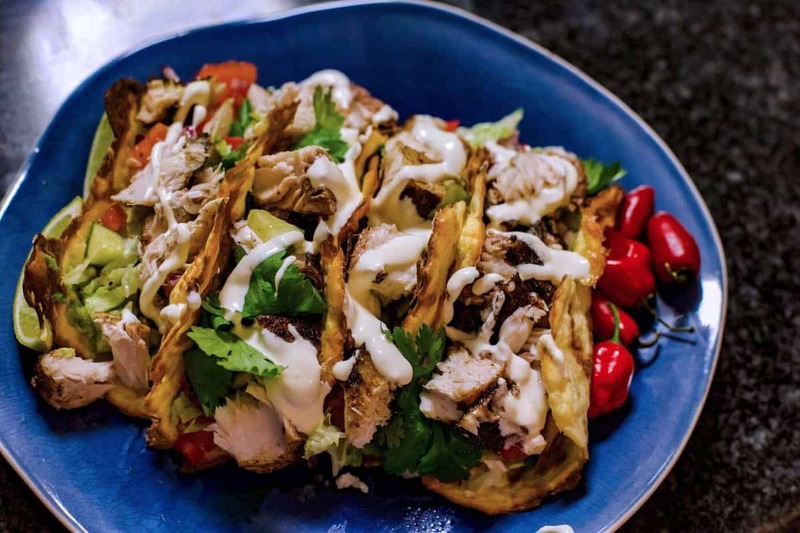 This Naked Chicken Keto Taco is one of the most fabulous looking recipes I have made, in my eyes. It not only looks fabulous and tastes amazing but eating Tacos like this is so much better, as it doesn’t crumble and break apart. Isn’t it just visually stunning? Please don’t be intimidated by the recipe, this is a very simple recipe, and if you don’t have a Thermomix, its still very easy, and if you can’t get the shape just make it as a schnitzel. However, this could be a bit of “WOW” factor at a Mexican Fiesta Dinner Party. This recipe can be made in advance and just keep the “taco shells” in the freezer ready to fry when needed. You can just as easily substitute the chicken for any protein including beef or fish and they will still work beautifully. Another version is to quite simply cut them in small pieces and fry as “nacho chips” as well. We have a fabulous Facebook community with over 15000 like minded members. Click below to join us. The best looking Taco on earth! Place between a split sealing sandwich bag, and only half press in a tortilla press. * Don’t have a tortilla press...dont worry roll into a ball, place between your split sandwich bag, and gently press with a plate. I really mean gently. Now, sprinkle with pork rinds, press rinds in firmly, and repeat other side. Remove disc and place on a sheet of baking paper, place a small object to wedge between the disc and and fold in half, “taco shape” and place in freezer for 10 minutes. I used my ice block moulds, but anything that can stop the two sides form touching without making your shell too wide is great. Heat your oil to boiling and place your half moons in separately. To maintain your taco shape just use tongs to push the breast slightly into shape and you will end up with the same result as me. It isn’t scary or hard. In fact this is extremely easy process to end up with an amazing looking taco! I have simply filled these suckers with a basic pico de gallo, and guacamole. With the addition of a bit of lettuce and sour cream. You can fill them with whatever you want! Just don't forget your favourite hot sauce. Even a fabulous chile con carne would be amazing with these, and dipping into a chile con queso. And lastly please please please share and tag me on your Insta, FB, whatever. You can see more on FB @ lowcarbmixers and more on my Insta too. 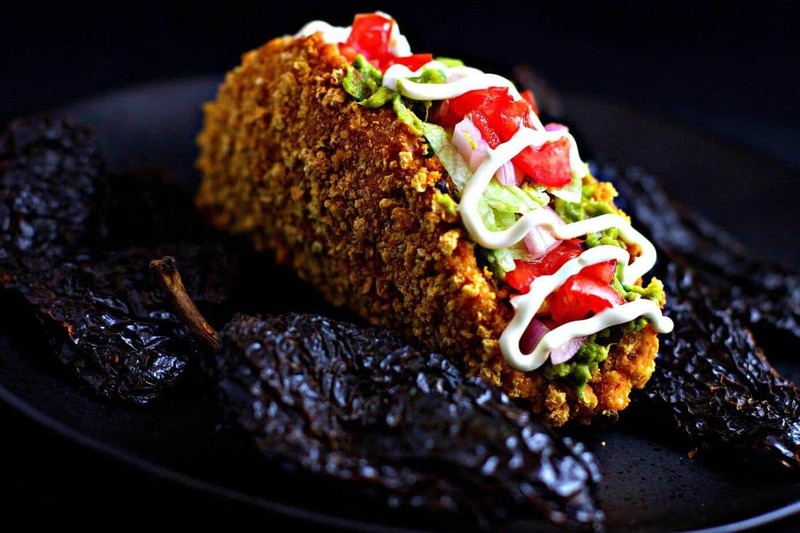 I want to see loads of these Tacos everywhere. • I have calculated the Nutritional Label as raw and unfilled. As you can fill this with whatever that will change the outcome, and of course using different fats, and temperatures would affect the absorbency of added fats. There is definitely more fat in the “Naked Taco” but the average Net Carbs are still are still incredibly low at only 0.55 grams. One of my true all time favourites.